Agilent's ADS is a powerful (and very expensive) electronic design analysis tool, but sometimes you have to wonder what they are thinking when they make it so hard to use. 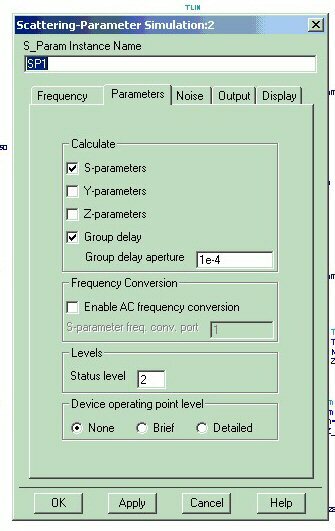 For example, where is the "group delay icon" in the S-parameter measurement group? There isn't one! What you need to do is click into the S-parameter "instance" in your schematic, and open up the parameters tab, which is shown below. Then check off group delay, and run the simulator. Now when you simulate, every single stinking S-parameter will have an associated group delay available in the plotting window. Chances are you just want S21, so ignore the rest.